I have mentioned before that I was a super picky eater as a child. I only liked vegetables that came from a can and only if those cans contained corn or green beans. There was one exception to the rule; cabbage. 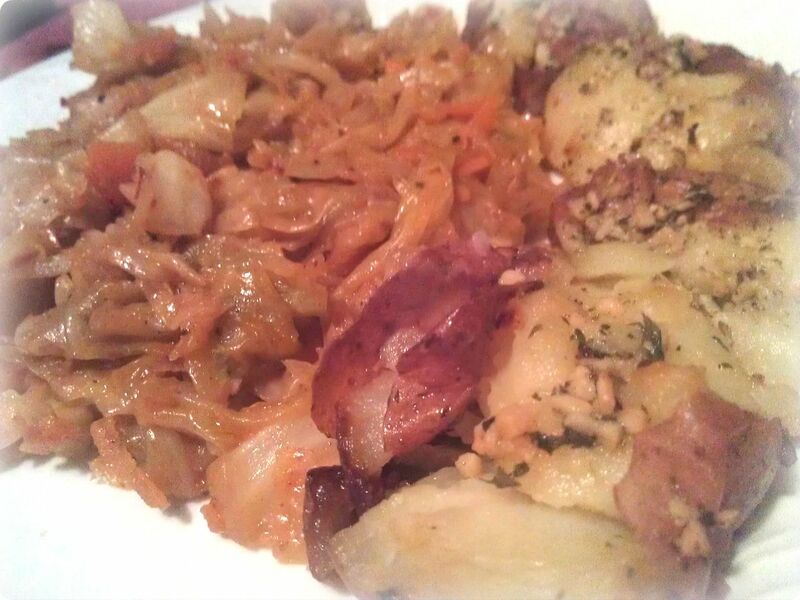 I love cabbage and my dear mother makes amazing cabbage and it is still some of the best I have ever had because she makes it spicy. I don’t think I have revealed this fact about myself yet… I am a spice fiend. My sour cream and yogurt loving Bosnian hubby had a very low spice tolerance when we met. We have changed each other for the better because he now enjoys his fair share of spicy foods and I am learning that not everyone wants a meal covered with sriracha sauce. With that being said, this cabbage is spicy. But a good spicy. No, make that a great spicy. It’s tender, semi- sweet and packs some heat. It’s an amazing side dish or main course meal, which is how we ate it last night for dinner. 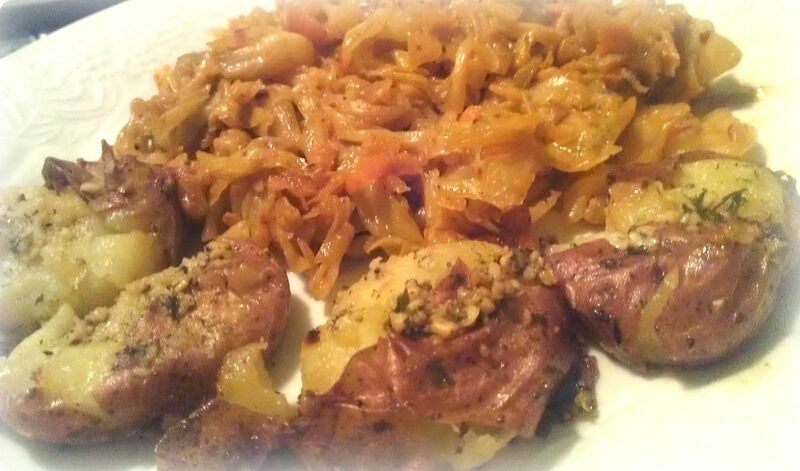 Unfortunately, cabbage doesn’t model well so the pictures are a little sketch and do not do this meal justice. Make it anyway. You won’t regret it. Your entire house will smell amazing and your belly will thank you. I give credit to my mom for making this one of my favorite childhood dishes. I modified it a little with some of my seasonings and the addition of carrots but it still reminds me of home. 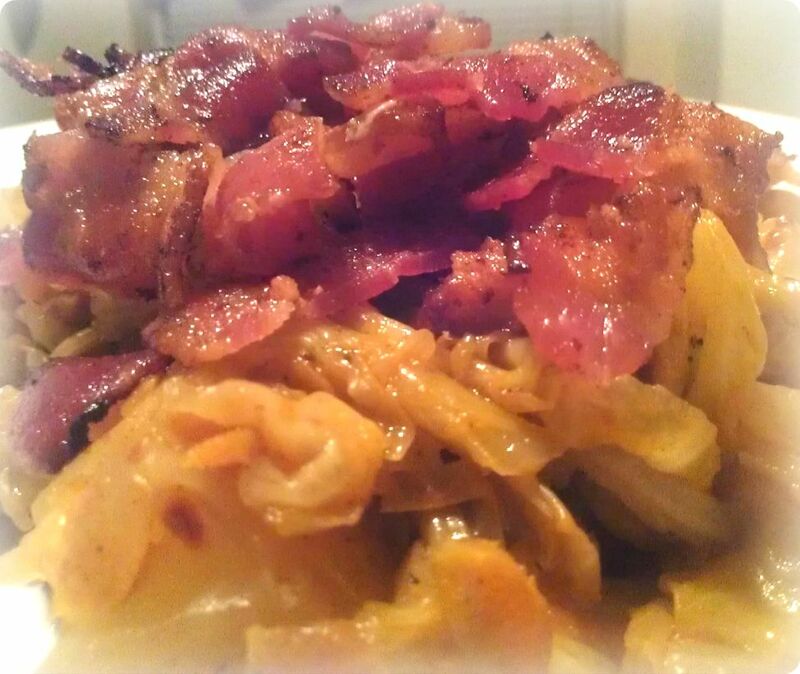 *I sprinkled maple bacon on D-Money’s cabbage because I know he loves it and we had some in the freezer. You don’t need to go the bacon route because it’s seriously amazing without it (I went sans bacon and still loved it). 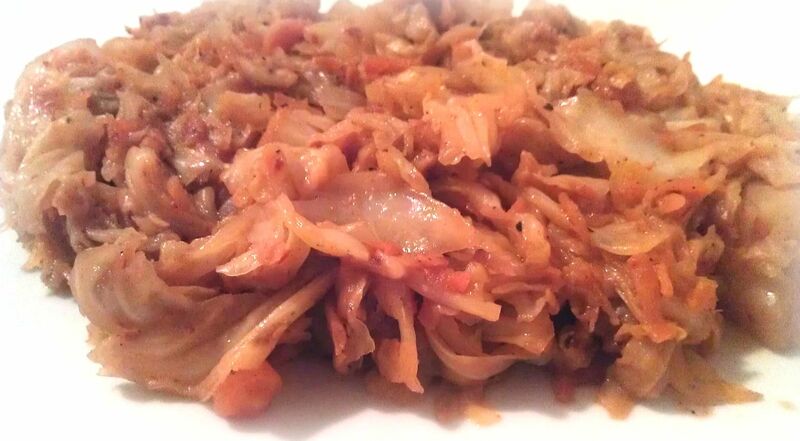 However, I made this cabbage for some friends before and added the bacon and they were blown away. 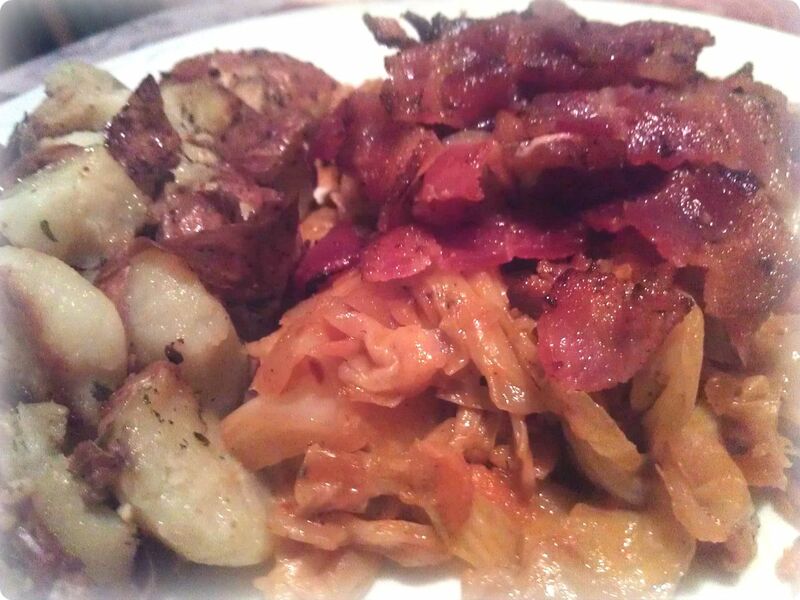 Bacon + spicy aromatic cabbage= happiness. 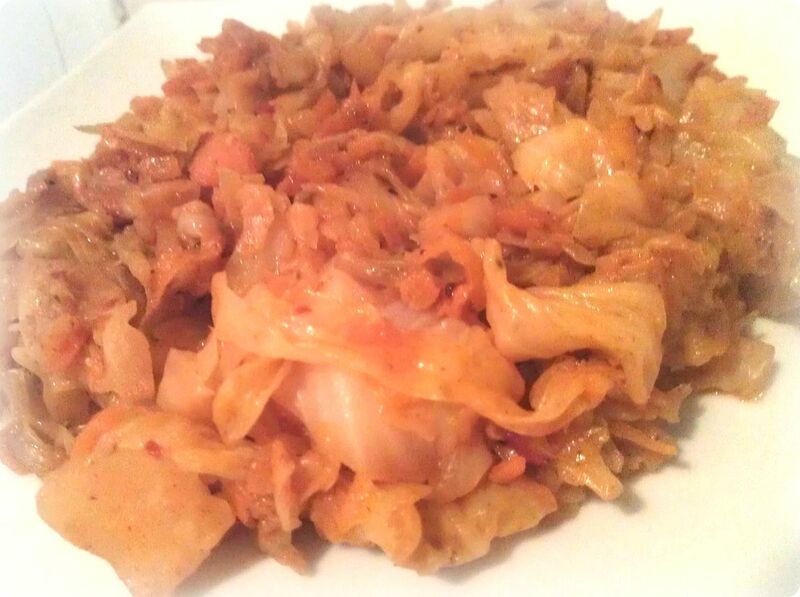 In general though, spicy aromatic cabbage = happiness. In a large pan, add olive oil and the vegetable stock and cook on medium high heat. Add the cabbage, sugar, paprika, crushed red pepper flakes, cumin, salt and pepper and stir well until all cabbage is coated with seasonings and the vegetable stock and oil. Simmer and cover for 15 minutes. Add in the shredded carrots and cook for another 15 minutes. At this point you may need to add the 2/3 cups of water (a little at a time). Allow the cabbage to cook with the water for another 10 minutes, mixing occasionally. The cabbage should be tender. I have made the mistake of removing it from the heat too soon and have regretted it. Let the cabbage work it’s magic and cook it down. 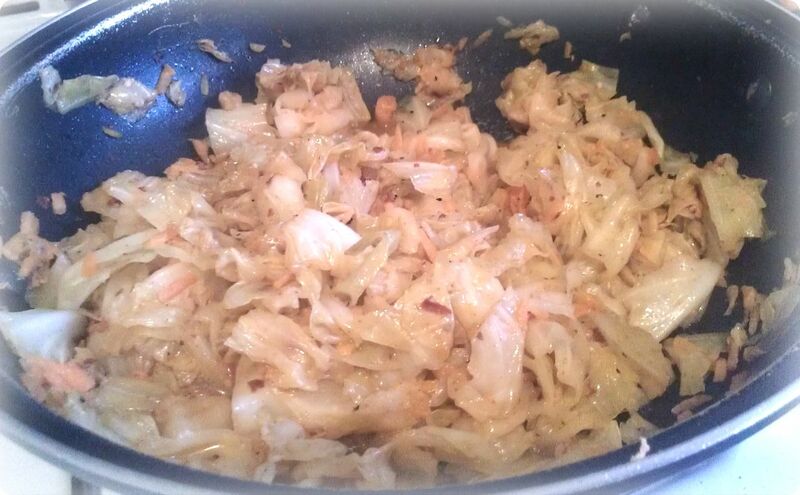 After the cabbage is tender, remove from heat and serve while hot. *If you are into the bacon topping, simply sprinkle the cabbage with cooked chopped bacon and serve to your meat eaters. Everyone wins because everyone gets to enjoy this cabbage. I served this meal alongside the garlic and mustard mashers leftovers from the other night.